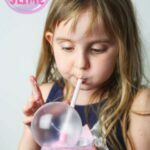 I’ve been making slime since Ella was three years old, so we’ve had our fair amount of experiments and failures. Black slime has been on Ella’s request list for a couple of years now, but to be honest, the thought of using tons of black food dye and then the possibility of it dying her hands, fingernails, and clothes black deterred me from even trying. 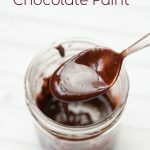 However, after learning that we could use acrylic paint to dye slime (like in our metallic slime), I realized that we could use just a half teaspoon of black acrylic paint to create a gorgeous silky, black slime! And of course, being the Disney family that we are, I thought black slime would be perfect for a villain slime! 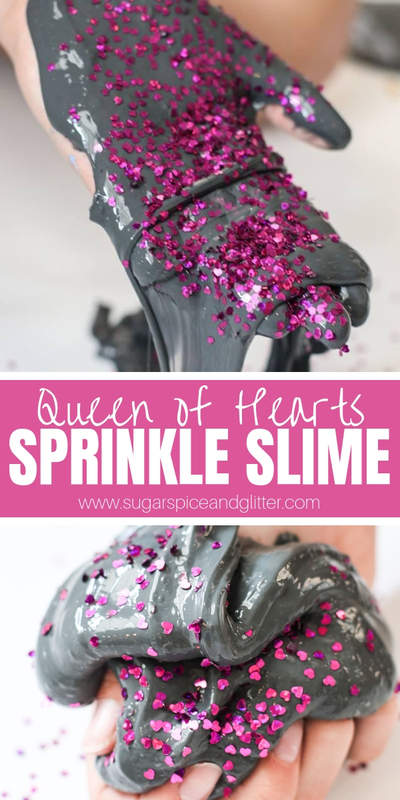 Ella suggested we use up the last of our pink heart glitter to make a “Queen of Hearts” slime a la Alice in Wonderland, and I think it turned out really cute! This would have been perfect for our Queen of Hearts Valentine’s Day party! 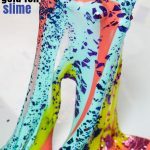 You could also use this to make a Cruella Slime (half black and half white), or a Maleficent Slime with some bright green glitter? There are so many fun options, and the black slime really makes whatever you add to it pop. Second tip: slime is not something you can reliably measure. It’s by look and feel, so go slow and adjust as necessary. 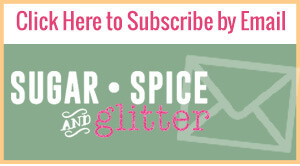 Pour your glue in a large mixing bowl. Stir the water into the glue, about 2 Tablespoons to start. Finally, add the contact solution or liquid starch – 5 Tablespoons of contact solution, or 1/4 cup liquid starch. Keep stirring everything with your spatula and adjust as needed. 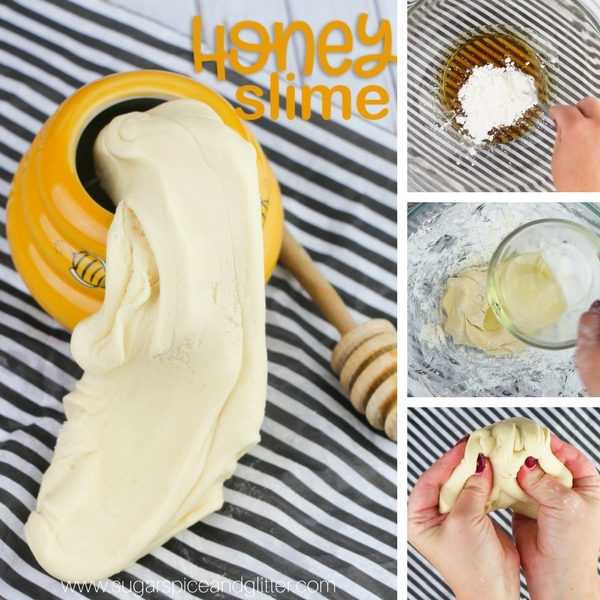 Once the slime is cohesive, no longer sticky or appearing to have any liquid in the mixture, start kneading the slime – this is going to help it be less sticky (just like making homemade play dough). Knead the slime for at least 3 minutes before adding any more ingredients to adjust. 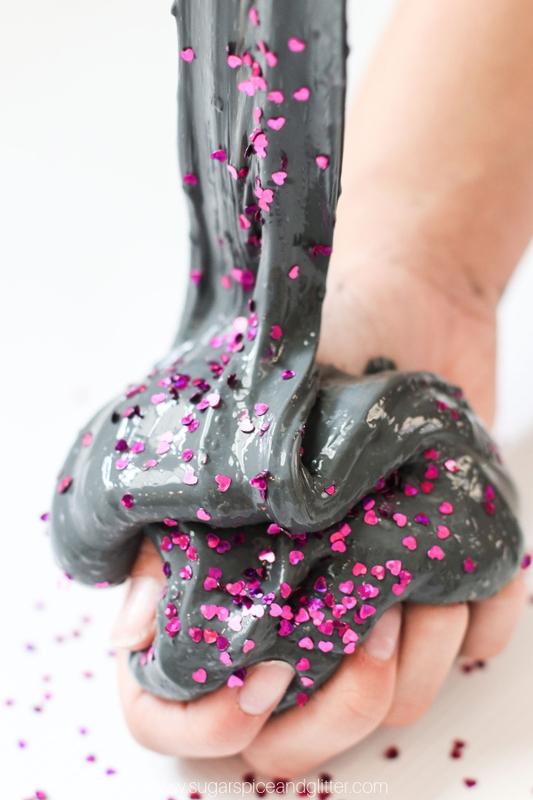 When your slime has the perfect consistency, add your heart sprinkles and enjoy! Finally, add the contact solution or liquid starch - 5 Tablespoons of contact solution, or 1/4 cup liquid starch. 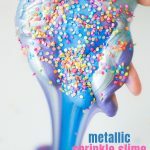 Once the slime is cohesive, no longer sticky or appearing to have any liquid in the mixture, start kneading the slime - this is going to help it be less sticky (just like making homemade play dough). 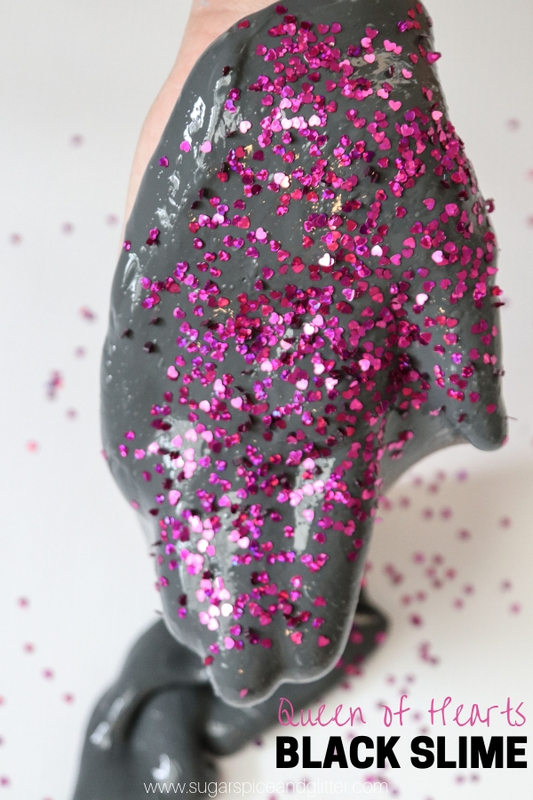 This super easy to make black slime recipe is the perfect base slime for so many different themes! 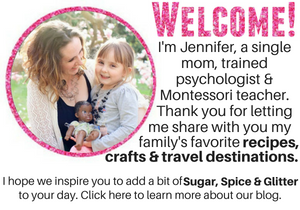 I can’t wait to see what different ideas you guys come up with! 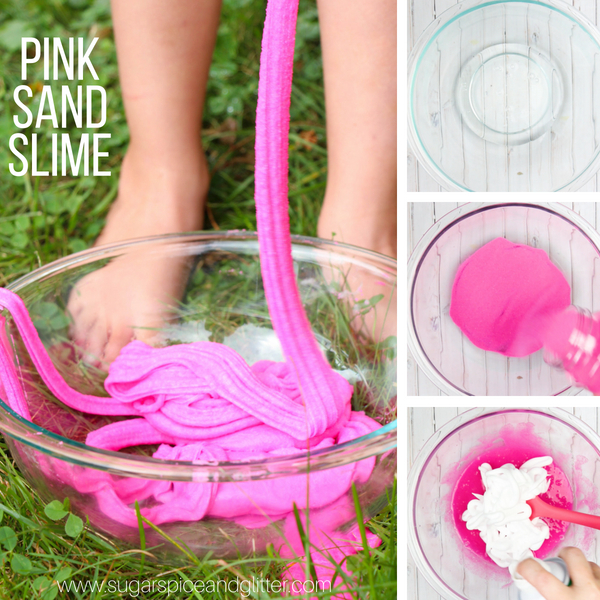 heck out our Pink Sand Slime or our Edible Honey Slime.